It’s been a banner week for corporate purchasers. First, Iron Mountain, Microsoft and Walmart announced power purchase agreements (PPA) with five wind projects across the country. On top of that exciting news, Microsoft also announced a new and innovative solution for corporate purchasers called the volume firming agreement (VFA), which will help large companies power even more of their operations using wind. Iron Mountain signed a 145 MW PPA with the Pretty Prairie Wind Farm in Reno County, Kan.
Microsoft signed a 90 MW PPA with the Big Level Wind Project in Potter County, Pa.
Walmart signed three contracts, including a 123 MW PPA with the 205 MW Bright Stalk Wind Farm in McLean County, Ill.; a 60 MW PPA with the 200 MW Headwaters II Wind Farm in Randolph County, Ind. ; and a 50 MW PPA with the 200 MW Harvest Ridge Wind Farm in Douglas County, Ill. The five wind projects are all expected to be operational by the end of 2020. An ever-increasing number of corporate purchasers are investing in wind energy because it provides stable, cost-competitive prices while also helping to achieve sustainability goals. Iron Mountain, Microsoft, and Walmart are similar in that they are all repeat customers with previous wind purchases, showing that companies buying wind see results that keep them coming back for more. “Wind energy is an important part of our energy portfolio, and Walmart plans to continue our efforts to pursue renewable energy projects that are right for our customers, our business, and the environment,” said Mark Vanderhelm, Vice President of Energy for Walmart. “What is especially exciting is that … 100 percent of our data center business now operates on renewable electricity … it’s truly remarkable to hit these goals in a ‘business-positive’ manner that leverages renewable energy to help us reduce utility expenses, stabilize rates and reduce the business risks associated with fossil fuels,” said Kevin Hagen, Vice President of Environmental Social and Governance Strategy, Iron Mountain. For companies seeking to purchase wind energy, signing a PPA continues to be one of the most popular tools available. To illustrate, AWEA data show that corporate and other non-utility customers have contracted for more than 10,000 MW of wind capacity through PPAs to date—more than the entire installed capacity of Oklahoma, America’s second largest wind state. Both large and small corporate purchasers see the value in signing a PPA. These contracts allow purchasers to secure a long-term supply of renewable energy at a stable price that protects against future fuel price instability at the same time. It’s like choosing a fixed rate mortgage over a variable one. However, the road to understanding and signing a PPA can be incredibly complex. To help simplify that process, Microsoft partnered with REsurety, Nephila Climate, and Allianz to design a solution called the Volume Firming Agreement (VFA). As with any contract, there are risks inherent to PPAs that need to be mitigated to secure the highest value for all counterparties. The VFA acts as a supplement to a PPA, isolating weather-related risks in the contract and allocating them to counterparties like insurance companies. These entities are experienced and eager to manage said risks on behalf of their customer. As a result, PPAs are made simpler and more valuable for the customer. We’re eager to see how this enables additional wind procurement moving forward for both large and small corporate customers. Interested in learning more about the Fortune 500 companies and other non-utility customers investing in wind? 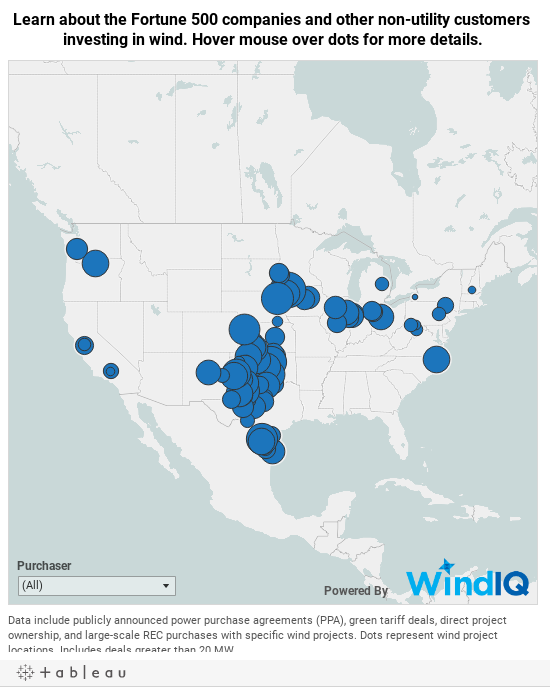 Dive into our interactive map, which illustrates all public wind procurement with non-utility customers at least 20 MW in size.